glossy color cover, 158 pages. This book ships ONLY in the U.S.
No refunds on this item. Note: This book is similar to Nick's later book, Ask The Headhunter: Reinventing the interview to win the job (Penguin Plume, 1997), which is no longer in print. "Thanks for making The New Interview Instruction Book available. I bought a copy as soon as you announced it, it arrived quickly, and I finished it in two days. I have been following you and recommending ATH for some time. Even so, The New Interview is right now helping me as I am trying to find a new position -- glad I ordered it! Also, thanks for the hand-written note on the shipping document. Nice to know that you still take that kind of personal interest. If I had ordered The New Interview Instruction Book about three days earlier, I think I may be having a different outcome on my most recent job interview." "I was in an interview process that had bogged down over the wrong things. Your advice to project I’m here to do the work was perfect. I left the manager in shock and had an offer within 12 hours for 10% more than I had expected." "Thanks! I start Monday as the Manager of Environmental Safety & Health for Intel’s Oregon site! I got the job -- with your help! I’m excited and grateful." "A real eye-opener, should be a must-read for everyone! Wish I had it 20 years ago! I have given your book to my executive operating group -- finding talented individuals is our single greatest challenge. Good insight on what happens in the entire interview & hiring process -- now I know how to start to get on top of it!" "Nick Corcodilos shreds some of our most basic assumptions about the way to hire top people - or to get hired. No manager can afford to miss what he has to say. The New Interview Instruction Book is both a radical approach to help job hunters win job offers and a powerful hiring tool for employers." "Your book made a huge difference during a very important change in my life. I can’t thank you enough for what it’s done for me. By preparing me to do the job rather than just interview for it, the book gave me the confidence I needed to present myself as the solution to the interviewer’s business problem." "I downloaded all your stuff from the Internet and went and got The New Interview Instruction Book. My other books are really not even worth looking at again. Your Four Questions are really the bottom line!" "I find The New Interview Instruction Book thoroughly exciting -- a real paradigm breaker, and a welcome one at that. Here it is a couple months later, and I'm still re-reading it and shaking my head going YES! Thank you for this important work!" "The New Interview Instruction Book is priceless - without a doubt the last book anyone will read on interviewing. I used the principles to land a job at a local hospital even though I have been out of the field for several years and competing against applicants with more varied experience." 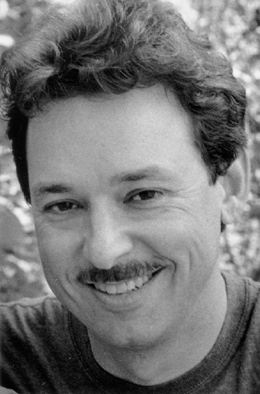 "Nick's book on interviewing is simply incredible and invaluable, especially in the computer industry. It has helped me identify what type of position I want and what type of company I want it with. BUY The New Interview Instruction Book! It is the best book I have read regarding getting a satisfying job." "The New Interview Instruction Book is fantastic! Over the last ten years, I've sat on both sides of the hiring manager/interviewee dialog. I've seen no other book that even comes close to telling it like it really is. No one has packed more useful, sensible information into a single source." "There's no question about it, I am your disciple for life. I did exactly what your book told me to do and followed your advice to the letter. And I GOT THE JOB! Not just any job, mind you, but $70K worth of Copy Director for [a major investment firm], plus a generous bonus. I’ve been giving the ordering information to everyone I know who's looking. Your book changed the course of my life forever, and I am eternally grateful that you were generous-spirited enough to share your knowledge and insights with the world. Thank you, thank you, THANK YOU!" "Forget everything you have ever learned about how to behave during a job interview. The New Interview Instruction Book is an unusual opportunity to learn from an expert." the 20th anniversary of its release. This is not a reprint - it's the original book! The New Interview Instruction Book was for sale only by mail order direct from Nick Corcodilos and the Motley Fool. 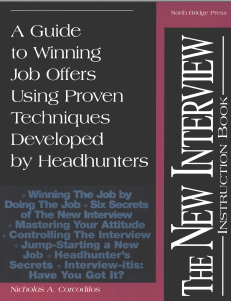 It was in this book that Nick introduced the key concepts and methods that are still the foundation of Ask The Headhunter -- methods for landing the right job by demonstrating that you can do the job profitably. The New Interview Instruction Book was published by North Bridge Press in December 1994 and released in 1995. It quickly became a mail-order best-seller. Major corporations took notice -- and used the book as a recruiting and hiring tool. A later edition (now out of print) was published by Penguin Plume as Ask The Headhunter: Reinventing the interview to win the job and instantly became an international best-seller in the U.S., U.K., China, Taiwan and Brazil. As a result, The New Interview Instruction Book was taken off the market -- but a number of copies were preserved in cold storage. this rarity is available until the limited supply runs out! Please Note: This classic book is similar to Nick's later book, Ask The Headhunter: Reinventing the interview to win the job (Penguin Plume, 1997), which is no longer in print. If you're a long-time Ask The Headhunter fan and don't have either of these books, you'll love The New Interview Instruction Book! You'll see how Nick elaborated the methods that mark his advice today -- including powerful how-to steps for managing your interviews. Interview-itis: Have You Got It? Is it any good today? Does a 20-year-old book that teaches iconoclastic interview methods mean anything today? If you're familiar with the acclaimed Ask The Headhunter website, blog, and newsletter, you know that Nick's methods are so fundamental that they stand the test of time. Yes -- the methods in this book are just as valid and powerful today as they were in 1995! In fact, they're the time-tested basis of everything you read today on Ask The Headhunter! Oh, there are of course some anachronisms in the book! Want ads? (What are they?) The Alta Vista search engine? (Say what?) And a few more anomalies of a distant time! Whether you'd like a copy because you missed it in 1995, or because you need its insider's insights and timeless methods today... The New Interview Instruction Book still delivers the core Ask The Headhunter lessons about how to win the right job! The Four Questions are still the best way to judge a job opportunity -- and to prepare for an interview. Understanding Interview-itis still saves you valuable time and energy when selecting employers. Broken jobs? You still must recognize and avoid them! Doing the job to win the job is still the surest way to get an offer! Taking control of interviews is still the best way to stand out! Nick's Interview Instructions still work -- and always will -- because employers always want proof that you do profitable work! The Power Of The Offer still helps job applicants negotiate powerfully and helps avoid the anguish of broken jobs! using proven techniques developed by headhunters! Why one candidate loses, and another wins: The critical difference between "doing the interview" and "doing the job." How the headhunter gets an employer to treat a job candidate like a valued employee -- you can do it, too! The original edition! Not a reprint! The supply of original copies of this 1995 classic is limited! GET YOURS NOW! ORDER TODAY! Do the job to win the job! The New Interview Instruction Book shows you how! A guide to winning job offers using proven techniques developed by headhunters. Just $29.95. Get the edge now! Limited time offer! Copyright © 2015 North Bridge Group LLC. All world-wide rights reserved. Ask The Headhunter®, the ATH logo and other ATH titles are trademarks of North Bridge Group LLC.